Plačlivý, with Ostrý Roháč are famous to form a narrow exposed ridge made of good granite, involving the most demanding scrambling in the Western Tatras all together. A touristic route goes on it, easing the task for tourist by the mean of fixed chains. However those with a fear of height should not attempt it. People sometimes surmane it the "Slovak Orla Perć", refering to the famous via-ferrata located in the Polish High Tatras. The traverse of this ridge was accomplished for the first time in 1908 by Valery Goetel, and for the first time in winter in 1911 by Mariusz Zaruski (the chains you see nowadays were not present at this time !). The same year a whole group of German alpinists died in this area. The presentations with Plačlivý are made ! From Krakow, Poland: Drive in the direction of Zakopane until Rabka, then the road that goes through Chocholow. Park the car at the entrance of Dolina Chochołowska (guarded car park, around 10zl + entrance to the national park, from 7am). From Slovakia, cross to Poland at Sucha Hora. From Poland, cross to Slovakia at the road toll at Sucha Hora, to reach Oravice and Zuberec. From Slovakia, reach Zuberec via Zilina and Dolný Kubín. From Poland, very long way... from Krakow, prefer the border point at Chyżne. From Silesia, choose Korbielow or Rajcza/Novot. Reach Dolný Kubín and circumvent Tatras. From Slovakia, via Dolný Kubín and Liptovsky Mikulas. - Offtrails is strictly forbidden in Polish Tatras. - Offtrails in Slovakia is tolerated for mountain-climbing, when accompanied by a registered mountain guide, or holding a licence of UIAA club. But not all zones. Natura 2000 zones are strictly forbidden. The west slope of Ostrý Roháč-Plačlivý, with the area of the lakes of Rohačká Dolina is such zone. Hence, the only place where such offtrail "might be" tolerated is Jamnická Dolina in the south. Since January 2008, both Poland and Slovakia belong to the Schengen european space, hence crossing the border is now allowed in almost all West Tatras (more precicely from June 15th 2008 which corresponds to the end of the slovak winter closure). Let's mention anyway that Volovec and Rysy) were however allowed for hikers long ago before that. But don't forget to always carry your papers in your rucksack if you plan to venture in the other country, even returning to the starting point. There are several ways to visit Plačlivý. Start in Žiar by the ascent of Baranec via Holy Vrch (yellow trail), and continue north via Baranec, Žiarské Sedlo, and Plačlivý. You can choose to extend the visit until Ostrý Roháč or not. The return is made by the descent in the valley Žiarska Dolina, from Smutné Sedlo. The circuit is best-made in this direction (storms), unless you plan to sleep at Žiarska Chata the evening before. From the base of the Račková Dolina is a wide choice of trails, and a very nice campsite. This is a good point to make a sporty circuit to this ridge, as well as Volovec and Baranec. After Volovec, return via the blue trail that goes along the beautiful Jamnické lakes. Always do the loop in this direction (clockwise), in order to prevent being trapped by a storm on the ridge in the afternoon. It is also possible to visit this ridge together with Volovec and Rákon, from the Dolina Rohačká. The most simple consists in climbing to the end of the valley, reach Smutné Sedlo via the blue trail, do the portion already described, and descend from Rakoń via the yellow and green trails. But if you are quick, it would be a shame not to visit the beautiful lakes Rohačké Pleso. This can be done in two maneers: from West to East taking the portion of green trail via the blue, which involves a bit of going-down before reaching the other blue. Or, the fittests can make it opposite way, which means Banikovské Sedlo, and climbing most of the sharps summits of the area in the same day, with huge elevation difference... In all cases, better do this loop in anti-clockwise direction. Camping is strictly forbidden in both National parks TPN (Poland) and TANAP (Slovakia). - Schronisko na Polanie Chochołowskiej (www.chocholowska.zakopane.pl), Dolina Chochołowska, Poland. This is a big hut and generally finding a place is not too hard. Take duvet and mattress anyway during sunny week ends when there is a lot of people. - Chata Zverovka (www.chatazverovka.sk), Rohačká Dolina (near Zuberec), Slovakia. This "mountain hut" is rather a hostel because accessible by road. For this reason, it is adviseable to book it as early as possible. Note that the hut marked "Bývalá Ťatliakova Chata" on some old maps, upper in the Rohacka valley is not a hut anymore but a place where they sell refreshments in summer. - Žiarska Chata (http://www.dolinky.szm.sk/chata.htm), Žiarska Dolina (near Žiar), Slovakia. This is a very beautiful newly-rebuilt hut, in a very nice location, with very little frequentation. It's possible to cycle until this place (but no bicycle rental..). 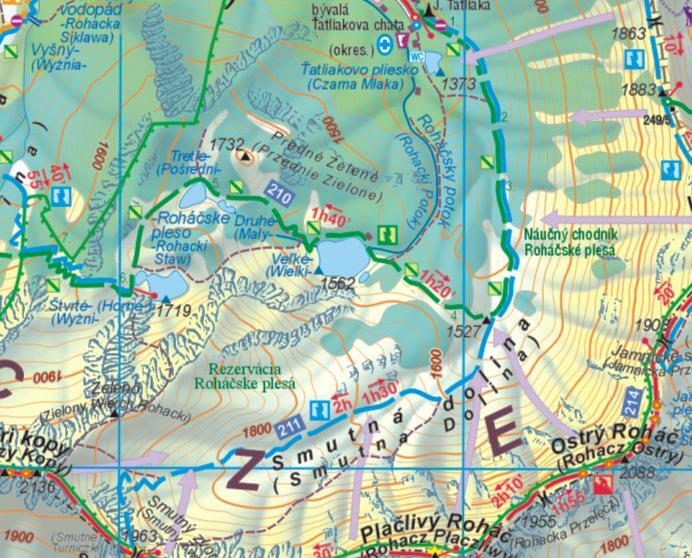 This starting point is ideal for the one who wants to climb Volovec together with Ostrý Roháč and Placlivé. - Let's mention also the existence of Koliba pod Pustým (link on Hiking.SK), in Jamnická Dolina. This is not an official moutain-hut but a simple shelter, in which hikers are tolerated for sleeping despite of TANAP regulations. Leave it as clean as you found it, or even cleaner. Share the space tolerantly with other people who might want to use it too. Since this hut depend on the municipality of Pribylina, foresters or TANAP rangers have the right to forbit it when they judge it's necessary.